Skull-A-Day 4.0 - Tutorial - #17 Tessellation Skull Scarf and Double Ended Skull Scarf...2 for 1! Inspired by Noah's 32: Interlocking Skull, I decided to make a Tessellation Skull Scarf using Filet Crochet. Last year, I made a gray double ended skull scarf, using filet crochet. The pattern for that one, as well as a photo, is that the very bottom of this post. As my husband put it, it's a "Two For One Thursday"...hehe. 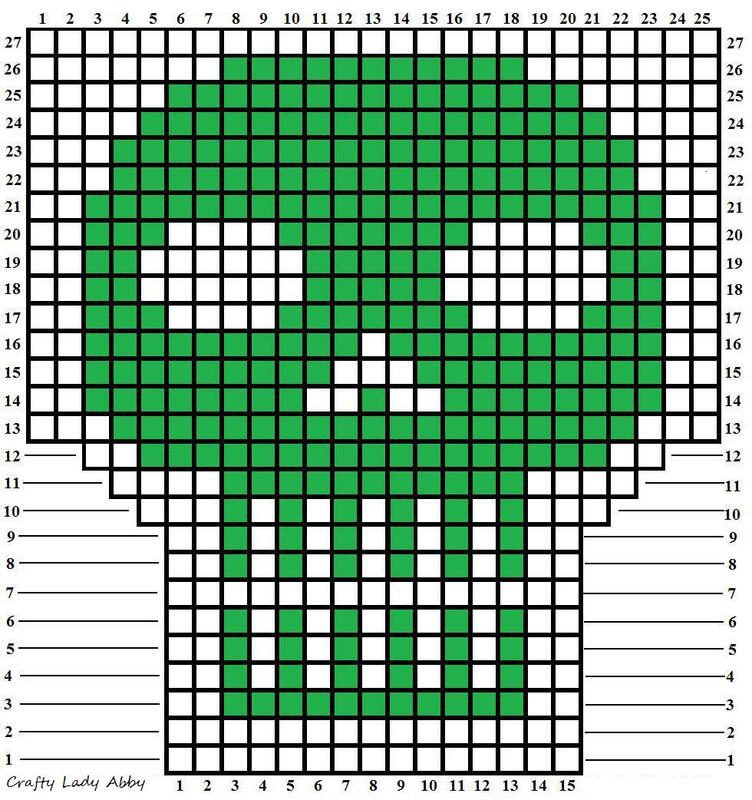 In June this year, I made a small Filet Crochet Skull that can also be used on a scarf, or what ever you like. The pattern for that is included in the post. This one is taking a long time to make. 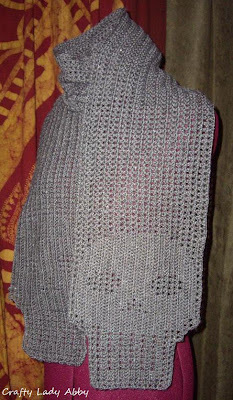 Unlike my other filet crochet scarfs, it has a lot of closed mesh, which increases the completion time substantially. I have no clue how long it will take me to finish, but I still wanted to share it. I took a close up photo and turned it, so the pattern would be easier to see. Click the image for a large/readable pattern in a new window. 2 Skeins of Caron Simply Soft Brites yarn in Blue Mint (turquoise color) - of course you can use a different color, but this yarn is really soft and nice. Small paper clips - to help with counting the base chain row and keeping track of row amounts. 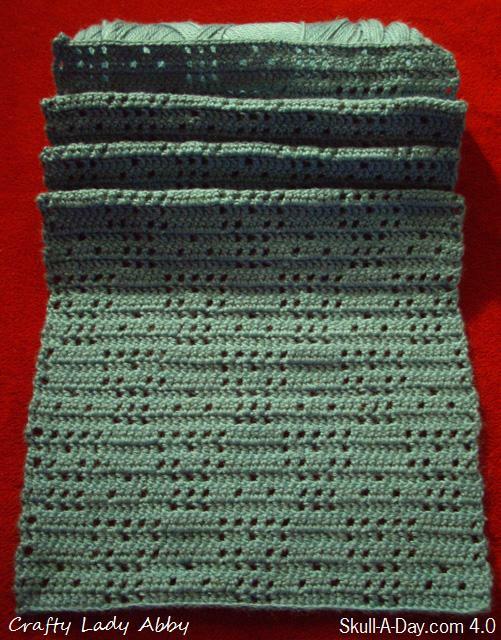 Instructions: I'll guide you through the 1st 12 rows and after that the pattern repeats, so I think you can handle it. Forgive me if this is worded weird, but this is the 1st long pattern that I've written. ROW 1 - Turn. Skip 1st 3 chains, 1 dc in 4th chain from hook, 1 dc in each of the next 9 chs, *ch 1, skip the next ch/stitch of previous row, dc in next stitch, repeat twice more (this will form 3 open mesh squares), 1 dc in each of the next 10 stitches (this will form 5 closed squares). REPEAT from * till end of row. 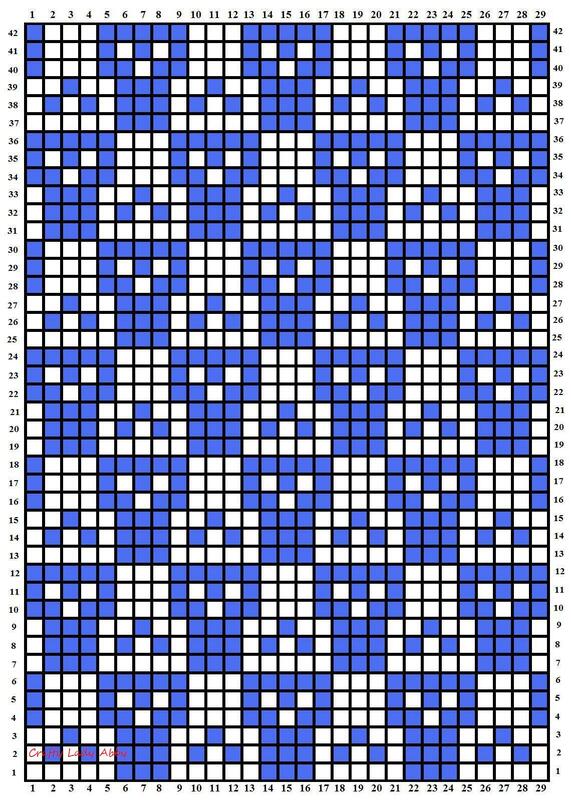 *CH 1, skip the next ch of previous row, DC in next stitch, repeat twice more (This will form 3 open mesh square that should line with the ones from the previous row). 1 DC in next 2 stitches, CH 1, skip 1 stitch from previous row, 1 DC in next 3 stitches, CH 1, skip 1 stitch from previous row, 1 DC in next 3 stitches. REPEAT from * till end of row. *CH 1, skip the next ch of previous row, DC in next stitch, repeat twice more. (This will form 3 open mesh square that should line with the ones from the previous row. This will finish the mouth area of the open square skull.) 1 DC in each of the next 4 stitches, CH 1, skip 1 stitch from the previous row, 1 DC in each of the next 5 stitches. REPEAT from * till end of row. *CH 1, skip 1 stitch from previous row. 1 DC in next stitch. CH 1, skip 1 stitch from previous row. 1 DC in each of the next 3 stitches. CH 1, skip 1 stitch from previous row, 1 DC in next stitch. CH1, skip 1 stitch from previous row, 1 DC in next stitch. (This will form the nose and cheek area of the open square skull.) 1 DC in each of the next 6 stitches. REPEAT from * Two more times. ROW 5 - Turn. Chain 4. DC in the 3rd stitch from previous row. (This will make another open square on top of the one from the previous row.) 1 DC in each of the next 6 stitches. *CH 1, skip 1 stitch from previous row. 1 DC in each of next 3 stitches. CH 1, skip 1 stitch, 1 DC in each of the next 3 stitches. CH 1, skip 1 stitch, (This will form the eye area of the open square skull) 1 DC in each of the next 7 stitches. REPEAT from * two more times. *CH 1, Skip next stitch, 1 DC in the next stitch. (Repeat 4 more times. This will make 5 open squares for the top of the open square skull.) 1 DC in each of the next 6 stitches. REPEAT from * two more times. *1 DC in each of the next 7 stitches. 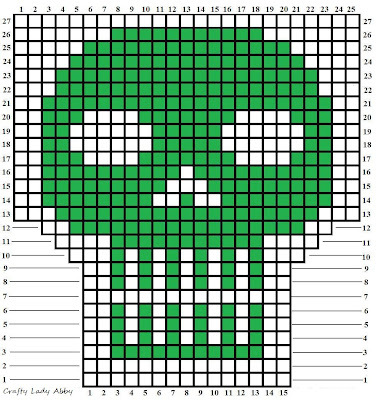 (This will make the top of a closed square skull) CH 1, skip next stitch, 1 DC in next stitch, CH 1, skip next stitch, 1 DC in next stitch, CH 1, skip next stitch. (This will make the beginning of the mouth of a open square skull) REPEAT from * two more times. *1 DC in each of the next 3 stitches, CH 1, skip next stitch, 1 DC in each of the next 3 stitches, CH 1, skip next stitch, 1 DC in each of the next 3 stitches. (This will make the eye area of the closed square skull) CH 1, skip the next stitch, 1 DC in the next stitch, CH 1, skip the next stitch, 1 DC in the next stitch, CH 1, skip the next stitch. REPEAT from * two more times. *1 DC in each of the next 5 stitches. CH 1, skip next stitch. 1 DC in each of the next 5 stitches. (This will make the nose area of a closed square skull.) CH 1, skip next stitch, 1 DC in next stitch, CH 1, skip next stitch, 1 DC in next stitch, CH 1, skip next stitch. (These open squares should line up with the ones on the previous row.) REPEAT from * two more times. ROW 10 - Turn. CH 4. 1 DC in the 3rd stitch from the previous row. CH 1, skip next stitch. 1 DC in each of the next 3 stitches. CH 1, skip next stitch, 1 DC in next stitch. CH 1, skip next stitch. *1 DC in each of the next 7 stitches. 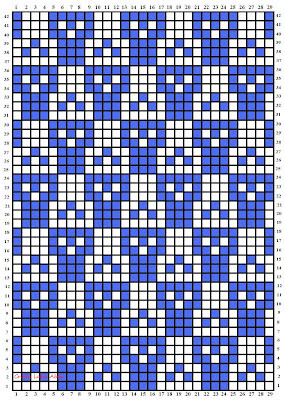 (This will make 3 closed squares) CH 1, skip next stitch. 1 DC in each of the next 3 stitches. CH 1, skip next stitch, 1 DC in next stitch. CH 1, skip next stitch. REPEAT from * two more times. 1 DC in last stitch of row. ROW 11 - Turn. CH 4. 1 DC in the 3rd stitch from the previous row. 1 DC in each of the next 2 stitches. CH 1, skip 1 stitch. 1 DC in each of the next 3 stitches. CH 1, skip 1 stitch. * 1 DC in each of the next 7 stitches. CH 1, skip next stitch, 1 DC in each of the next 3 stitches. CH 1, skip 1 stitch, 1 DC in each of the next 3 stitches. CH 1, skip next stitch. REPEAT from * two more times. * 1 DC in each of the next 7 stitches. (This will make the last part of the mouth of the the closed square skull) CH 1, Skip next stitch, 1 DC in the next stitch. (Repeat 4 more times. This will make 5 open squares for the top of the open square skull.) REPEAT from * two more times. Repeat the steps for Rows 1-12 over and over until desired scarf length is achieved. If you are new to crochet, as we all were once and don't know what the heck I'm talking about when I say "Filet Crochet", then use this video series to learn how it. 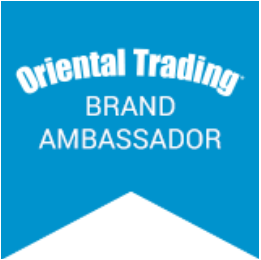 This shows you the basics and uses a small project. Basic Filet Crochet is super easy and what I used to make my 1st big crochet project. 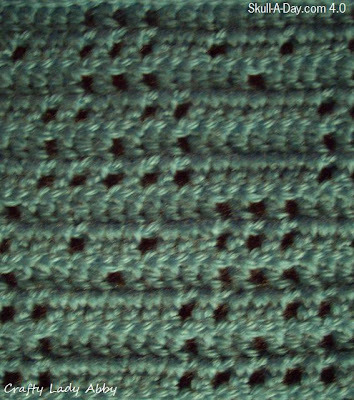 Filet Crochet only uses Chains (ch) and Double Crochet (dc). The hard parts are keeping track of your pattern, increasing and decreasing. I keep track of my rows by using small colorful paper clips at the end of every other row. I also use a ruler to move along the pattern as I complete each row. 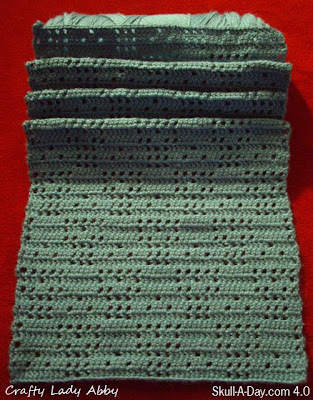 Increasing and Decreasing can be a bit tricky and not all Filet Crochet patterns need them. My Tessellation Skull Scarf doesn't have them, but my Double Ended Skull Scarf does. 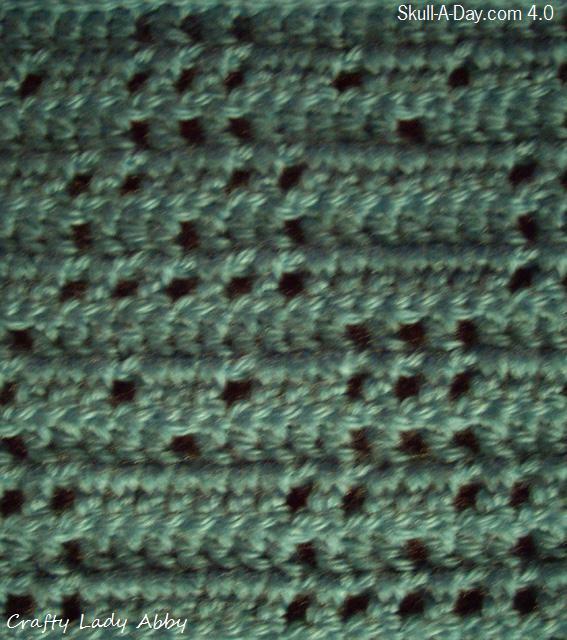 Both increases and decreases require different stitches than the basic pattern of chains and double crochets. I couldn't find a video, but the diagram in the above tutorial is very clear. Decreasing is much easier. 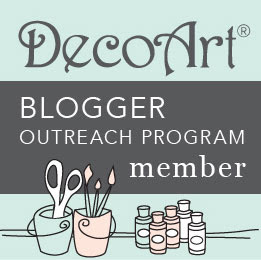 If you have any crochet questions, feel free to ask me and I will do my best to answer them.